This entry was posted on November 20, 2018. Technology continues to change and adapt on almost a daily basis, and over the last few years, has made its way into our homes in unexpected ways. The "smart home" movement has changed the way we think about and use everyday staples, from Wi-Fi controlled thermostats to internet connected fridges with built-in screens. 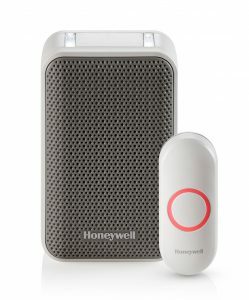 With this trend continuing to grow, and our continued commitment to providing the best in service and selection, we are pleased to announce the arrival of Honeywell Wireless Door Chimes. Rather than the classic builders-kit, these chimes offer various features you can customize to suit your needs and taste, and can be setup by anyone in minutes. Each model comes with a wireless push button that is weather resistant, has a light-up LED ring, and can be surface mounted and battery powered. The introductory model plugs into any standard outlet, has a built-in strobe light notification when the button is pressed as well as a selection of 6 chimes to choose from. 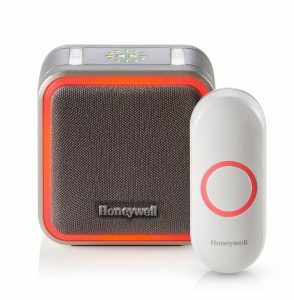 This model is wireless and can be mounted on the wall, or taken anywhere around the home, with a button range of 350 feet, It is powered by 3 AA batteries, which can last up to 2 years before needing to be changed. 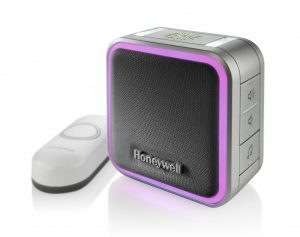 While also having a strobe light notification and 6 chimes to choose from, it also has a built-in halo light with selectable colours that flash when the button is pressed. The premier model has all the above functions, plus it can be plugged into any standard outlet, so no need to worry about battery life. You have the option of also pairing multiple buttons to each chime if you would like to place them at other entrances or points of access around your property, with additional buttons available in black or white. (8864 - White, 8865 Black).